The LABOCA camera on the ESO-operated 12-meter Atacama Pathfinder Experiment (APEX) telescope reveals distant galaxies undergoing the most intense type of star formation activity known, called a starburst. 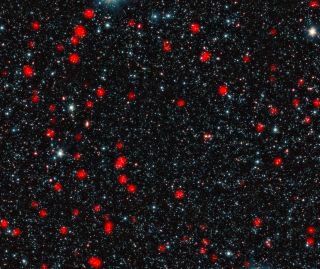 Clusters of distant galaxies that were bursting with newborn stars in the early universe eventually became the most massive galaxies today, a new study finds. A team of astronomers found a strong link between active starburst galaxies of the early universe and the giant elliptical galaxies we now see. The star formation in these early galaxies was abruptly cut short, and the researchers pointed to the eating habits of supermassive black holes as the likely culprit. "This is the first time that we've been able to show this clear link between the most energetic starbursting galaxies in the early universe and the most massive galaxies in the present day," lead scientist Ryan Hickox, of Dartmouth College and England's Durham University, said in a statement. What they found was that galaxies that are closely huddled together have larger halos of dark matter, the elusive, invisible material thought to make up most of the mass in the universe. To study how these galaxies evolved, the researchers measured the masses of the dark matter halos around the galaxies and used computer simulations to predict how they grow over time. Their calculations showed that these starburst galaxies become giant elliptical galaxies, which are the most massive galaxies in the universe today. The starburst galaxies are so distant that their light takes roughly 10 billion years to reach Earth. This allows astronomers to observe them as they were 10 billion years ago, in the early universe. At that time, the galaxies were undergoing a frenzy of intense star formation, which scientists classify as starbursts. The results of the new study are the most accurate clustering measurements ever made for this type of galaxy, European Southern Observatory officials said in a statement. The astronomers found that these starbursts were extremely productive, doubling the number of stars in the galaxies. But the phase lasted only 100 million years — a relatively brief period on cosmological scales. What caused this abrupt end to the rapid star formation was a process that has not been well understood. "We know that massive elliptical galaxies stopped producing stars rather suddenly a long time ago and are now passive," study team member Julie Wardlow, of the University of California at Irvine and Durham University, said in a statement. "And scientists are wondering what could possibly be powerful enough to shut down an entire galaxy's starburst." Observations from this new study point to supermassive black holes as a possible explanation. The intense bursts of star formation could have powered quasars, which are regions around black holes that gobble matter and give off intense radiation into space. At that stage in the universe's history, starburst galaxies were gathered together in a way that is similar to quasars and were found within the same dark matter halos. Quasars are powered by supermassive black holes at their centers, and as they flung powerful bursts of energy into the cosmos, they also could have blown away the galaxies' surrounding gas, which is the raw material from which stars are born. This dynamic process could have been powerful enough to abruptly shut down rapid star formation. "In short, the galaxies' glory days of intense star formation also doom them by feeding the giant black hole at their center, which then rapidly blow away or destroys the star-forming clouds," David Alexander, of Durham University, said in a statement.